We’ve introduced you to plenty of amari, the bitter Italian liqueurs, in the course of this column. But Meletti Amaro is different from some of the super-light or super-bitter bottles out there. It’s rich and caramel-y, almost chocolate-y, without being cloying in the least; it has a fascinating array of flavors, from saffron to anise, resulting in a balanced, complex liqueur. Served as a digestivo — an after-dinner sipper, generally poured neat — it’s a beautiful drink. But it’s also incredibly versatile in cocktails. It has the herbs and botanicals of many of its fellow amari, without being as nearly bitter. As a result, it can play a vermouth-like role in a Manhattan, be the anchor for a big pour of soda, or add depth and character to a sour. And in the winter, its richness plays beautifully in seasonal drinks. Here’s how to make it work. Just combining Amaro Meletti and club soda gives you an amazing pre-dinner aperitif — a perfect balance between sweet and bitter, brightened up with a bit of lemon. It highlights the liqueur’s caramely, chocolatey qualities without being too rich or cloying in the slightest. And given Amaro Meletti’s low proof, you can have more than one on an empty stomach. Instructions: In a tall glass with ice, combine 1 1/2 ounces of Amaro Meletti and 4 ounces of club soda. Stir briefly and garnish with a few lemon wheels. When you add sweet vermouth to a drink, it contributes sweetness (natch) but also a certain richness and an array of botanical flavors — exactly how we’re using Amaro Meletti here. Reposado (slightly aged) tequila has a certain grassy quality that meshes perfectly. This is a stiff drink, but an awfully friendly one. Instructions: In a mixing glass with ice, stir together 2 ounces of reposado tequila and 1 ounce of Amaro Meletti. Stir until very well-chilled. Strain into a chilled cocktail glass. Squeeze a lime peel over the glass to release its citrus oils, and add as a garnish. Here we’re using a rye sour as a template to take the slightly spicy whiskey and integrate it perfectly with rich, complex Meletti. 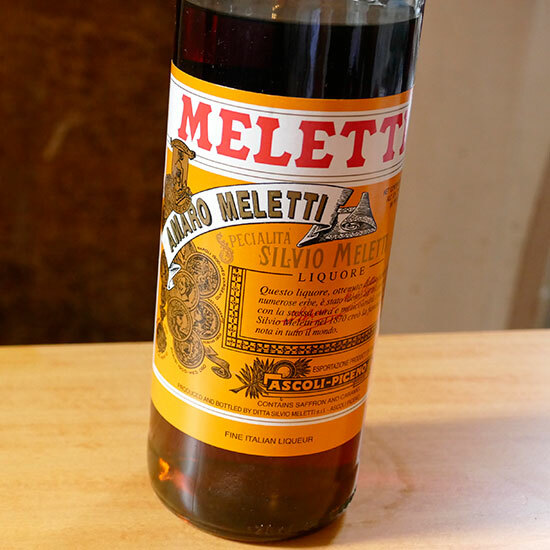 Here, Amaro Meletti gives the drink a sort of mystery, a “what is that fascinating flavor?” without anything too aggressive. We promise, it’s a crowd-pleaser. Instructions: In a cocktail shaker without ice, combine 1 1/2 ounces of rye, 3/4 ounce of Amaro Meletti, 3/4 ounce of fresh lemon juice, 1/2 an ounce of simple syrup, and 1 egg white. Shake all that up without ice to aerate it — that’s called a “dry shake” — and then add ice and shake again for a “wet shake,” to chill it down. Strain into a rocks glass over fresh ice. Garnish with a lemon wheel and a cherry.